Join Alex the Lion, Marty the Zebra, Melman the Giraffe, Gloria the hip hip Hippo and, of course, those hilarious, plotting penguins as they bound onto your stage in the musical adventure of a lifetime with Madagascar – A Musical Adventure at the New Wimbledon Theatre. Based on the smash DreamWorks animated motion picture, Madagascar – A Musical Adventure follows all of your favorite crack-a-lackin’ friends as they escape from their home in New York’s Central Park Zoo and find themselves on an unexpected journey to the madcap world of King Julien. 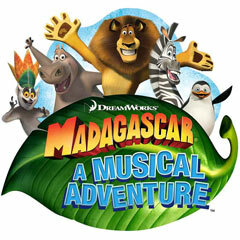 Filled with outlandish characters, adventure galore and an upbeat score, Madagascar – A Musical Adventure will leave you with no choice but to “Move It, Move It!”.